Universal Stylus Touch Screen Pen for iPhone iPad Tablet Samsung 1 Pcs Color. Part compatible models: iphone 3G, iPhone4, Iphone4g, Iphone4s, Iphone 5, ipad 2 3 ,Ipad New. 10 Pcs Stylus Pen, Color：Random. Compatible Model: for LG Stylo4，Q710x Series. Type: Stylus Pen. 1 x Stylus Pen. Color: Gray. 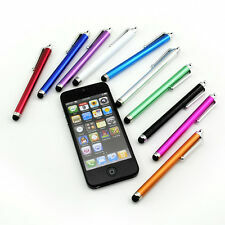 Universal Stylus Touch Screen Pen for iPhone iPad Tablet Samsung 1 Pcs Color. 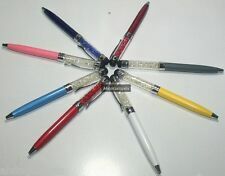 10 Pcs Stylus Pen, Color：Random. Also note that monitor settings may vary from computer to computer and may distort actual colors. Ø Phone stylus pen with anti-dust plug removes smudges and fingerprints from your screen with a soft, durable rubber tip and attached anti-dust plug for earphone jacks. Phone Stylus Pen with Anti-Dust Plug. 10 Pcs Stylus Pen. Also note that monitor settings may vary from computer to computer and may distort actual colors. Prevent your screen free from scratches and fingerprint. Light weight design, convenient to carry. Ø Stylus pen phone stand 3 in 1 tech tool. Three functions in compact pen design. Stylus, ink pen (rotate tip to switch between pen & stylus, contoured barrel that acts as a phone stand. Assorted colors, including red. ). For Samsung Galaxy Tab S3 S4. The nib of the stylus pen is made of rubber, the other part is made of plastic. Perfect fit for Samsung Galaxy Note Series Stylus Pen. for Samsung Galaxy Note 8/ 5 /4. for Samsung Galaxy Notebook 9. Lets you type, tap, draw and scroll the screen with ease and precision. Works great with cell phones, tablets, MP3 players and other devices equipped with a capacitive touchscreen. 3.5 mm standard audio plug fits in most devices' headphone jack for easy carrying and storage. 10x Stylus Touchpen Eingabestift Staubschutz. Praktischer und handlicher Touchpen im 10er Set. Weicher Rundkopf für eine präzise Eingabe auf dem Display. Gleichzeitig schützen die Touchpens den Kopfhöranschluss vor Staub und Verschmutzungen. Compatible with Samsung Galaxy S IV S4 i9500 i9505. Samsung Galaxy S4 SIV i9500 i9505 not included. With its attractive design, the C Pen allows you to make quick notes, draw or edit in addition to performing typical touch screen commands. SONY ERICSSON. PDA PEN- STYLUS. WE LOVE GOOD COMMUNICATION. COLOR SILVER/GREY. WE ARE WHOLESALERS.